Chicken Curry is one of my favorite healthy dinner ideas for when I’m on a time crunch but need to feed my kids on the fly. I simply drop in a few chopped ingredients and voila! Dinner is served. Serve with aside of rice or pair with my Cauliflower Couscous, Moroccan Style Carrots or Roasted Rainbow Veggies to complete the dish and unlock all the yummy benefits stored in these exotic ingredients. 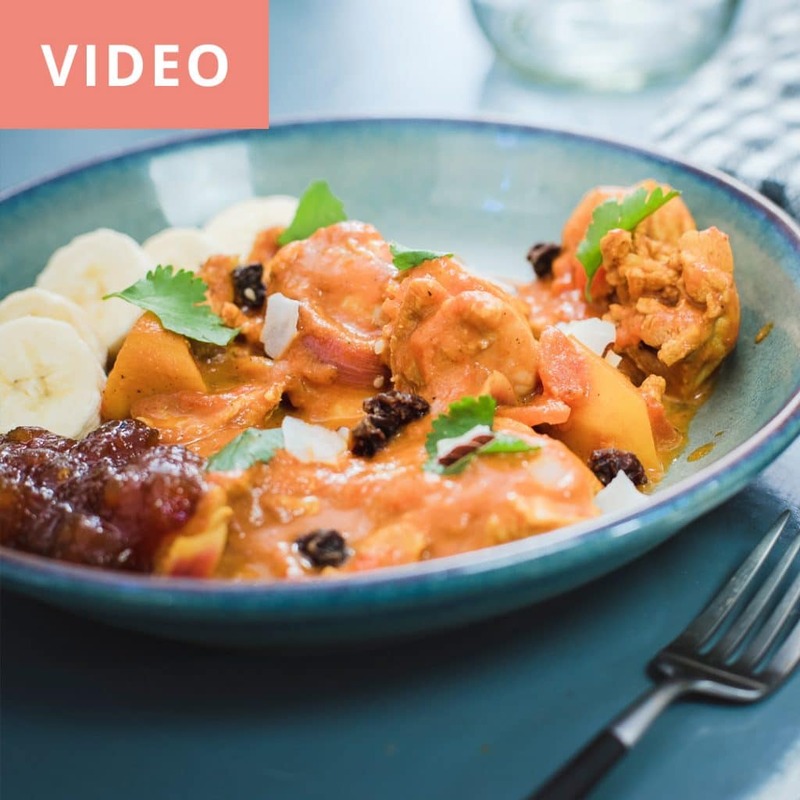 Watch my video for step-by-step instructions on how to prepare my version this delicious Indian inspired Chicken Curry. Subscribe to my YouTube Channel to receive instant updates of new and fresh recipe videos by yours truly. 1. Add 1 tbsp of coconut oil of coconut oil to a pot set on medium heat. 2. Next, add 2 cups of red onions. 3. Cook for 5 minutes stirring regularly. 4. Add chopped apple chunks to the pot. 5. Season with 4 tbsp of curry powder. 6. Add fresh black pepper. 7. Add 1 cup canned tomatoes to pot and stir. 8. Add ½ cup of coconut milk to pot and stir. 9. Reduce temperature and let simmer for 8 minutes. 10. While the pot is simmering, cut chicken into chunks and then add to pot and let simmer for 10 additional minutes. 11. Serve and with chopped bananas and garnish with cilantro, raisins, and mango chutney.